Yes, more pizza! I’m still not sick of making pizza at home. It’s so incredibly easy to make and with the variety of toppings, it’s a different pizza every time. 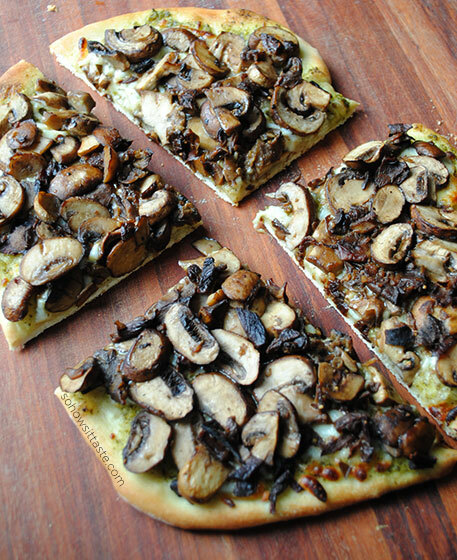 I’m a huge mushroom fan and this Mushroom Pesto Pizza instantly caught my eye. I had a jar of pesto in the fridge and porcinis in the freezer, so there wasn’t much else for me to buy to whip this up. 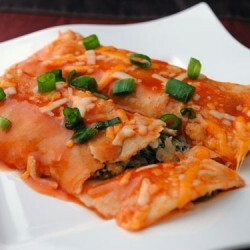 Love using up items in my pantry/fridge so they don’t go to waste. I loved it! First, let me explain my pizza. I planned to halve this recipe, but as you can see I only halved the dough and piled on the mushrooms. Oops! I had a teeny bit more of the porcinis than the recipe called for, but not enough to make another recipe, so I used them all. Half of the other mushrooms in the recipe would have been six ounces, but I had an eight-ounce carton, so again I used them all. That’s why you see mushroom overload on my pizza. I still loved it! I used baby bellas instead of the exotic mix of mushrooms because I’m cheap and I knew the porcinis would bring a ton of flavor, so paying extra for fancy mushrooms was pointless to me. The pesto served as the sauce and all those herbs and oil went perfectly with the mushrooms. There’s a little bit of mozzarella underneath to make this cheesy. You could certainly use part-skim mozzarella instead of whole-milk mozzarella if you want to bump the calories down a bit. As I’m writing this post, I’m thinking about how my mom and I used to order mushroom pizzas all the time. It was either plain mushroom, or if we were splurging it was pepperoni and mushroom. That is my favorite classic pizza combination. I think it was last year that my mom finally confessed to me that SHE HATES MUSHROOMS. First, what? 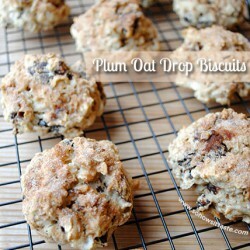 I know tons of folks fall into that category, but they are so delicious. How can you hate them? They don’t taste like celery (worst veggie ever). Second, what! Yes, folks, my mom ate mushrooms on her pizza for decades and acted like it was her favorite too all because it was my favorite. She’s eaten countless meals with mushrooms in them, too. All because I like them so much. So when they give out the best mom ever award…mine totally wins. *Note: You can substitute any type of mushroom as the porcinis will give a ton of flavor on their own. 2. Place the dough in a medium microwave-safe bowl coated with cooking spray. Cover and microwave at Â­MEDIUM (50% power) 45 seconds. Let stand 5 minutes. 3. Combine 2/3 cup water and porcini in a 2-cup glass measuring cup. Microwave at HIGH 4 minutes or until tender; drain. Coarsely chop porcini. 4. Heat a large skillet over medium-high heat. Add oil; swirl. Add fresh mushrooms and garlic; sautÃ© 5 minutes. Stir in porcini, pepper, and salt. 5. Roll dough into a 12 x 8-inch rectangle on a floured surface. Carefully remove pizza stone from oven; arrange dough on pizza stone. Spread pesto over dough, leaving a 1/2-inch border. Sprinkle cheese over pesto; top with mushroom mixture. Bake at 500Â° for 13 minutes or until crust is browned and crisp. Cut into 8 slices. this pizza looks fantastic, too. pesto + mushrooms are two of my most favorite things to eat. This looks fantastic – adding a few things to my shopping list now! 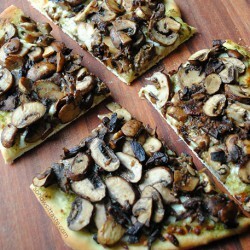 I think the dried porcini mushrooms probably add that extra oomph, and the pizza looks amazing and sultry. You know this pizza is speaking to me. I want it RIGHTNOW. I love mushrooms. All mushrooms. And, funny, you and I have a couple more things in common: my mom, too hates mushrooms. Except she’s never tolerated them. Our pizzas had half mushroom and half bell pepper (which I will not eat). Also? Celery is THE WORST. I can tolerate a bell pepper before celery. How funny! So glad you’re in the no celery club. That is one veggie I cannot understand. I need to try that! I bet it would taste good! 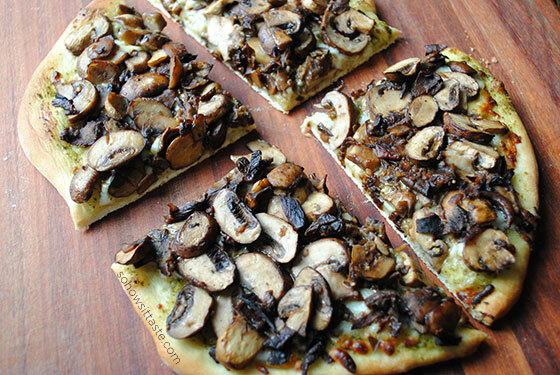 Loaded with mushrooms, this is one gorgeous pizza!! Awww, the story about your mom is SO sweet! And this pizza looks like heaven to me! I never ate mushrooms growing up b/c I was determined I hated them. I re-tried them at maybe 25 years old and … surprise!… I loved them! Since then I’ve been a huge mushroom junkie, so I know I’d loooove this pizza. 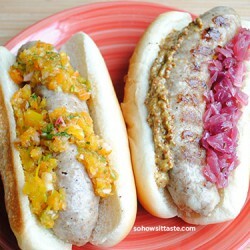 Double win since you used up some leftovers in your fridge/pantry! This pizza looks like a mushroom heaven to me! We are big pizza eaters in this house so we need to give this a try!